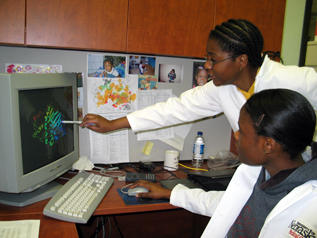 Oluwatoyin Asojo, Ph.D., standing, discusses a crystal with her laboratory research technologist Michelle Ngamelue. Oluwatoyin Asojo, Ph.D., has seen first-hand the devastation of such diseases as malaria, hookworm and HIV in her native Nigeria. As a child, she made a promise to herself to do something about it - and she has. On March 1, Dr. Asojo, assistant professor in UNMC's Department of Pathology and Microbiology, received the University of Nebraska at Omaha's 2006 Women of Color Award. She was one of six award recipients, but was the inaugural winner in the science and technology category. "I am honored to receive this award because it honors two things I hold very dear - academic excellence and community service," Dr. Asojo said. "My parents infused the importance of scholarship into me when I was a very small child. When I graduated from high school in Nigeria, I was one of only seven students to receive a full scholarship to the United World College System out of over 10,000 students competing. There were so many equally worthy scholars in Nigeria, but I learned that my community service history helped tip the scales in my favor." The United World College System (www.uwc.org) includes universities in Montezuma, N.M., in the United States and Italy, Canada, England, Singapore, India and Swaziland, (in southern Africa). The students are chosen from among the best of the best around the globe and a heavy emphasis is placed on a student's record of community service, as well as high academic achievement. The colleges aim at promoting international peace and global awareness by bringing together youths from diverse backgrounds. 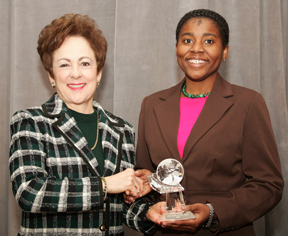 Oluwatoyin Asojo, Ph.D., right, receives her award from UNO Chancellor Nancy Belck, Ph.D.
During her elementary and secondary school days, Dr. Asojo volunteered for many years at an orphanage, or "motherless babies' homes" as they are called in Nigeria. She and some of her classmates would spend hours simply holding and entertaining one child after another. She also volunteered with children with developmental disabilities, who are still considered social pariahs in many African nations. And from the time she was 8 years old, she tutored lesser-educated children from poorer neighborhoods in English as Second Language skills. Dr. Asojo's father was chief laboratory technologist and head of histology for the College of Medicine at the University of Ibadan in Nigeria. From elementary through high school, she would go to his laboratory after school for three or four hours, two or three times a week. "Laboratory specialists spend a great deal of their lives in the lab, so it was actually the best way I could really hang out with my father on a regular basis," Dr. Asojo said. "I started staying with him in the lab when I was 8. By the time I was 9, I was performing some basic tasks in the lab. I loved science and I got to spend all this time with my father. Those were just wonderful years for me." Dr. Asojo's academic credentials include an international baccalaureate diploma in 1989 from Pearson United World College, British Columbia, Canada; bachelor's of science degree in economics and chemistry from Trent University, Ontario, Canada in 1992; bachelor's of science degree with honors in chemistry from Trent University in 1993; and doctorate in chemistry from the University of Houston, (Texas) in 1999. She did two post-doctoral fellowships at the National Cancer Institute from October 1999 to May 2003. She also worked for a year at Tibotec-Virco, a pharmaceutical company in Rockville, Md. Dr. Asojo joined UNMC in 2003 as a research assistant professor at the Eppley Research Institute. At Eppley, she initiated structural studies on membrane proteins involved in multi-drug resistance (a serious problem in the treatment of many diseases including cancer) and developed collaborations to study parasitic nematode and malaria, as well as ran their X-ray crystallography facility. Hookworm is an intestinal parasite that usually causes mild diarrhea or cramps. An estimated 1 billion people -- about one-fifth of the world's population -- have hookworm infections. In 2005, she was awarded two NIH grants to study multi-drug resistance in cancer and alternative therapies to address hookworm in order to alleviate the economic and social burdens of these diseases. That same year, she was appointed assistant professor in the department of pathology/microbiology, where she continues her research on immunity and crystallography, as well as collaborates with the human hookworm vaccine initiative, (www.sabin.org/hookworm.htm) directed by Peter Hotez, M.D., Ph.D., at George Washington University. The collaboration with the Gates Foundation-funded human hookworm vaccine initiative was initiated in 2002. Dr. Asojo's focus is to examine public health issues, such as hookworm, from a macro-molecular level, and to help address public health issues in Nebraska and the world. Dr. Asojo has spent her career investigating treatments and cures for diseases that affect predominantly poor populations, including hookworm, cancer, malaria and HIV, as well as mentoring economically disadvantaged youth and persons of color in the field of science. 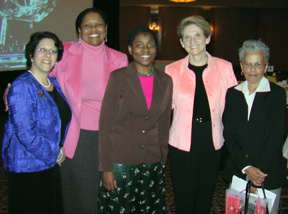 Dr. Asojo, center, with UNMC colleagues from left: Magda Peck, Sc.D., professor of pediatrics and public health; Valda Boyd Ford, director, Community and Multicultural Affairs; Virginia Tilden, Ph.D., dean, College of Nursing; and Martha Foxall, chairwoman, CON Parent-Child, Administration Education and Science. The past six years, Dr. Asojo's research focus has been on the structure of these diseases and how to treat/cure them from a molecular structure level. She uses a technique called X-ray crystallography, and often has been able to "grow crystals" when other scientists have failed. She is extremely conscientious about the environment and only uses procedures and chemicals that are environmental-friendly. This is rare in her field and has played a role in the success of her crystallography. "I hope to spend many more years with UNMC and continue my research in multi-drug resistance and immunity," Dr. Asojo said. "I also want to develop a research program that will bridge with the community and enable us to inspire many more minority women to pursue biomedical research careers. "I hope to improve upon the current landscape for scientists of color. I hold an adjunct position in the college of pharmacy at Ogun State University in Nigeria. We hope to develop collaborative and training grants to help expand academic excellence and research there. Receiving the UNO Women of Color Award not only means a lot to me personally, and to my colleagues here at UNMC, but it also will inspire other women in Africa to believe that they, too, can become scientists and compete on a global level." Kristin Landis, research and education services manager, UNMC department of pathology and microbiology, nominated Dr. Asojo for the UNO Women of Color Award and contributed material to this article.